It’s time to remove those items of clothing from the floor and invest in a state of the art wardrobe and storage system that will change your life. As with cars, watches and shoes, it pays to obtain the very best – over time they reward you with not only the pleasure of enjoying a wonderful piece of engineering and workmanship, but also the satisfaction of realising that over time, it was money well spent. This maxim can also be applied to one’s home and wardrobe with Rimadesio wardrobes, storage systems and glass doors. Rimadesio, a prestigious Italian company, has been manufacturing glass since 1956 and over time they have become renowned for the extraordinary range and quality of their glass room dividers, storage systems, walk in wardrobes, shelving and sliding doors as well as a complementary furniture range in the smooth metal finishes for which they have justifiably become famous. The ultra smooth aluminium joinery that surrounds the glass panels comes in a vast range of finishes and colours – anodized, lacquered, powder coated, brushed or with a fine wood veneer overlay. With nearly seventy colours to choose from plus the input of a personal in house Rimdesio trained designer, your wardrobe can be designed to accommodate requirements that are uniquely yours whether you have row of jeans and white shirts or a full complement of evening wear worthy of George Clooney or pre Daniel Craig James Bond. 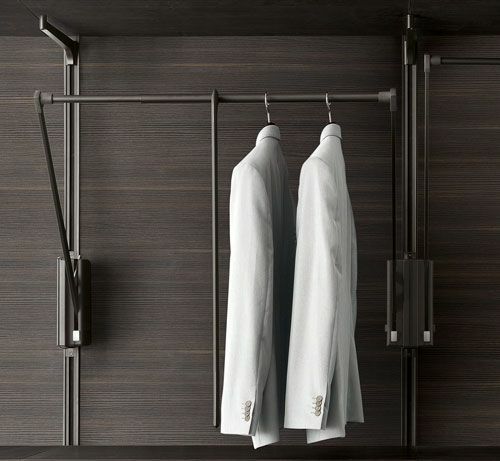 Not only that, depending upon available space and any budgetry constraints, you can start out with a simple minimalist system, then as you require more space over time, you can add from the modular selection of pull down shirt racks, mobile drawer units, back lit shelving, shoe or tie racks and leather lined compartments to show off your watches, cuff links, cravats, tie pins or gym socks. However the most vital feature of your wardrobe may well be the glass doors themselves – the glass, because it is of such extraordinary quality and has so many options, can form a room divider as well as creating a translucent effect – being able to see though into another room but still having the advantage of a natural or lit see through effect. This use of room dividers has become important for adding flexibility and privacy to large open plan environments, especially important in the luxury apartment market. The glass doors and dividers do not just glide, they noiselessly float, as the sliding doors are top hung and can be floor to ceiling, full height no matter how high your ceiling stud. The glass itself is tempered or double glazed for soundproofing and safety as well as being scratch resistant. It can be Vitrine – completely transparent or otherwise frosted and coloured as well as an option with fine aluminium mesh encased within the glass. Particularly with the addition of light, this latter option can create extraordinary effects with the aluminum mesh available in a range of colour options. 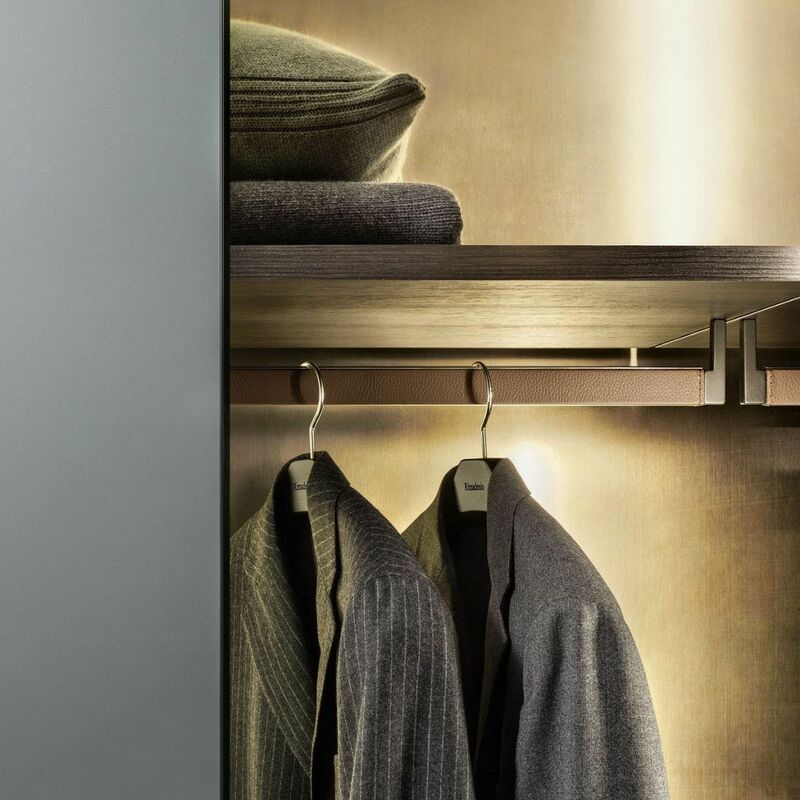 It is then a matter of choosing a style of wardrobe from the systems available – the Dress range has full freedom of composition with suspended wall unit and shelf options plus the choice of glass doors while the Cover freestanding collection is a cabinet system of single glass pivot doors with aluminium framing and glass back and side panels encasing your garments. The Abacus system, perfect for easy access when dressing, can also be adapted as a commercial display wall. Rimadesio pairs luxury with sustainability – their two base materials, glass and aluminium are entirely recyclable and their production plants are solar powered with zero annual carbon emissions. They are also committed to using non hazardous material including non polluting water based paints for their Ecolorsystem of glass colours. Understated good taste, superb materials and workmanship plus the underlying integrity of design of a Rimadesio wardrobe will always enhance your life but as an added bonus you will always have your clothes and accessories to hand, ready and in perfect condition for the gym, the boat, the boardroom or the ballroom.